DEADLINE EXTENDED TO SEPTEMBER 15th! 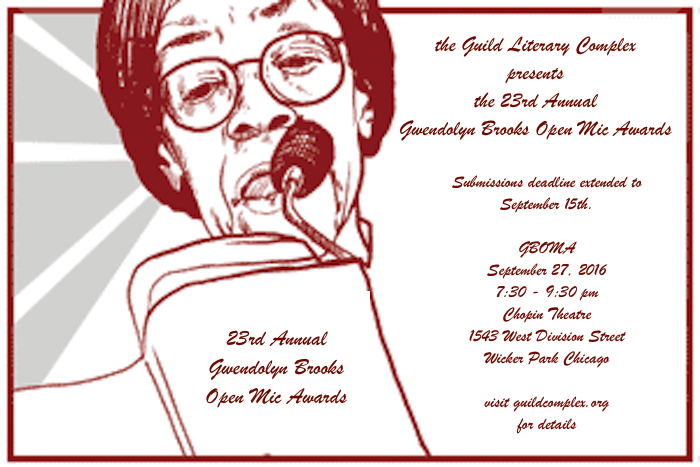 Guild Literary Complex announces its open call for poetry submissions for the 23rd Annual Gwendolyn Brooks Open Mic Award. Deadline to submit is has been extended to September 15th, 2016! Twenty (20) selected semi-finalists will compete for a $500 prize in front of a voting audience on Tuesday, September 27, 2016, 7:00 p.m. at the Chopin Theatre (1543 West Division / Chicago, IL 60642). Complete guidelines for qualifying submissions are below. The Gwendolyn Brooks Open Mic Award competition is open to Illinois residents aged 18 and older. Pulitzer Prize winning Chicago poet Gwendolyn Brooks (1917-2000) founded the Gwendolyn Brooks Open Mic Award twenty-two years ago. Brooks was born in Topeka, Kansas and lived in Chicago for the rest of her life. She was the author of more than twenty volumes of poetry and numerous other books. Her many awards and honors include Poet Laureate of Illinois, Consultant in Poetry to the Library of Congress, American Academy of Arts and Letters award, a Pulitzer Prize, the Frost Medal, a National Endowment for the Arts award, and fellowships from The Academy of American Poets and the Guggenheim Foundation. Past GBOMA winners include Sename Amagashie, Lucy Anderton, Tara Betts, C.C. Carter, Stephanie Gentry-Fernandez, Marian Hayes, Tricia Hersey, Tyehimba Jess, Langston Kerman, Toni Asante Lightfoot, Nate Marshall, Sage Morgan-Hubbard, Stephanie Rose Perez, Tristan Silverman, Dan “Sully” Sullivan, Mark Turcotte, Deepak Unnikrishnan, and Javon Smith. The 23rd Annual Gwendolyn Brooks Open Mic Awards is presented in partnership with the Chopin Theatre, Wicker Park, Chicago. Semi-finalists will be posted soon. Sign up for our email list to be alerted to future contests. Here is an article from New City talking about last year’s GBOMA awards, and watch the entire 22nd Annual event here on Youtube on CAN TV. Participant must be 18 years of age or older by September 27, 2016. Participant must currently live in Illinois. Submit one original poem. No exceptions. Poem must be submitted in print (via email or mail) in a legible 12-point font. Poets must be available to perform their poem at the live event on September 27th, 2016. If selected as a competing semi-finalist, attendance at the event is mandatory. You will not be considered for the prize if you are not able to perform at the event. Deadline to submit is Thursday September 15th, 2016. Mailed applications must be received by September 15 2016, – this is not a postmark deadline. Emailed applications must be received by 5:00 p.m. CST on September 15th. Submissions cannot be made in person. Send submissions to contests@guildcomplex.org and put “GBOMA submission” in the subject line. In the body of the email, include your full name, street address, email address, telephone number and name of poem. Attach your poem as a Word document or PDF. The poem should have no identifying information except for the title of the poem. Once your submission is emailed, please go to guildcomplex.org, click on the “donate” button, and submit your $5 submission fee via PayPal. Once your submission is mailed, please go to guildcomplex.org, click on the “donate” button, and submit your $5 submission fee via PayPal. DO NOT send materials to the Chopin Theatre. Any poems delivered there will not be considered. We’ll send you an acknowledgement email to let you know your submission arrived and has met the guidelines. Semi-finalists will be notified by September 22, 2016. For facts and questions please visit: guildcomplex.org/gboma. If you do not find the answer you need, write to us at contests@guildcomplex.org.